Actually, MOOCs aren’t new – they first originated around 2008, which is about 20 years ago in computer years. They are aimed at large-scale participation and open access via the Internet and often use open educational resources. Typically they do not offer academic credit or charge tuition fees. Because of this, only about 10% of the tens of thousands of students who may sign up complete the course. I say because of this subjectively. As someone who has participated as a student in a MOOC, I have experienced the huge drop out that occurs sometimes just days after a course has begun. I was a student some 5 years ago in a muvenation course: the first course of its kind to teach real life educators how to be virtual world teachers. This did offer certification upon completion which, though at post graduate level, was really no more than a ‘placebo’-it was a piece of paper, it told you that you were able to perform specific skills at specific levels, but was not designed to be recognised as an accredited qualification. Participation and assessment occurred predominantly in Second Life, but also via wikis, Flickr and Moodle. At the start of the course something like 400 people enrolled or showed interest, with only 40 participants completing the course. This fits nicely in to the 10% success rate I mentioned earlier, but in this instance is a pity as the course was fantastic: very well designed, genuinely interesting and innovative, and a real pleasure to take part in. Why do people drop out? I’m guessing that lack of time is the most common reason cited by those who do leave a course before its end, but I suspect that there’s often more to it than that. Humans like to earn badges and add strings to their bow. If course completion isn’t rewarded by something (even if it is a placebo), then they wander off track and will find something that does offer tangible reward. There is something else I think is important too – and that’s cost and its allegiance with ownership. So can MOOCs be successful? Futurelearn, the first UK-led, multi-institutional platform for free, open, online courses, certainly thinks so. Their plan is to increase access to higher education for students in the UK and around the world by offering a range of courses through a single website. They are partnering with the British Library, British Council and 17 of the UK’s top universities (including the very university for whom I work) and will launch their first courses later this year. Futurelearn are also majority owned by the Open University. Kudos (and years of experience) ahoy! Whilst MOOCs don’t always lead to formal qualifications, they allow students to gain invaluable knowledge to support their careers, or their own personal learning goals. There are no entry requirements and students can take part in the courses regardless of where they live in the world or their financial circumstances. Now this is something I can get my head around: the fact that students enrolled on MOOCs can gain knowledge that will implicitly help them in their careers or personal targets -or simply because they want to learn something new for no reason other than to have learned something new. I’m a huge advocate of keeping the brain muscle flexed: that if we exercise our minds in the same way we do our bodies, then we may stave off senility and remain as sharp in later life as we were in our youth. 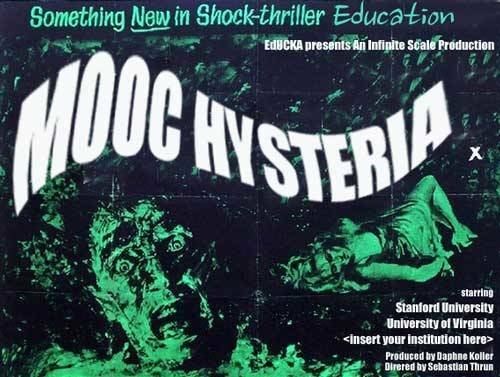 Maybe MOOCs can be a cerebral dumbbell of sorts – maybe they should become compulsory for the over 60s?! This entry was posted in Technology Enhanced Learning and tagged MOOC, online learning. Bookmark the permalink.